MEMBERSHIP CARDSSport and Recreational Flying at its best! 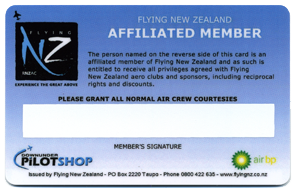 Membership cards are produced annually by Flying NZ, for all members of aero clubs affilliated to Flying NZ. This is a free service for clubs. The face of the card is personalised with the Club's logo and the members name, status and membership number. Cards are issued on the submission of the club's member list to Flying NZ. The Flying NZ membership card is your passport to reciprocal rights when visiting other affiliated clubs. 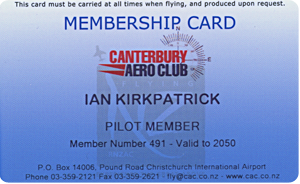 Some clubs, located on secure airfields will only allow Flying NZ card holders airside. Flying NZ does not disclose member details to any third party. Membership cards are personalised with both Club and Member details. A signature strip is included for security. Please note that cards can only be ordered by clubs. Individual members who have not been issued a card, or require a replacement card, should contact their local club.